So you remember when I said summer had arrived just in time for Chelsea? Well I’ve been wrong before. It was a very gloomy start to Chelsea this year with the brollies and ponchos making an appearance straight off the bat. Also, as I write this, the ground outside is white with hailstones now that the thunderstorm has passed. Thinking of Peace (Tatyana Shykarenko): This small show garden is ingenious in the simplest possible way. 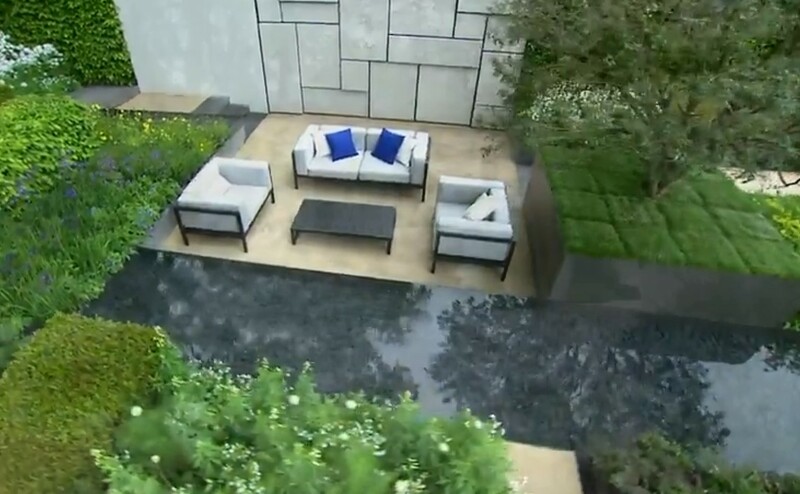 Rather than include water in a subtle and complicated way, the designers have simply flipped the idea of what a garden water feature should be and plonked a beautiful border planted island in the middle of a hyper modern reflecting pool. Sounds a little simple but the overall effect is fantastic, the slight matte edging given to the planted island gives it the illusion of hovering over the mirror like surface of the pool. All this is offset wonderfully by the use of a rain curtain as a backdrop – Nylon threads suspended in a metal frame have water constantly running down them, giving a perfect impersonation of a curtain of rain to go with the actual curtain of rain falling next to it. 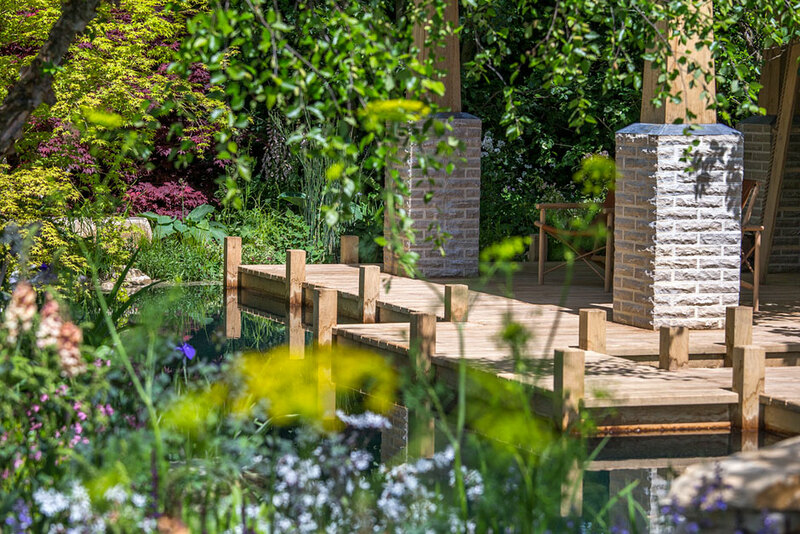 The Telegraph Garden (Marcus Barnett): This year’s offering by the Telegraph is a wonderful piece of design, but the thing that really draws the eye is the central water feature. A stream running past the seating area is in fact a raised platform over which runs water. The trick is the way the water flows smoothly across the platform and cascades off the sides in the process giving the illusion of a moving three dimensional shape made of water, intriguingly wonderful. The Chatsworth Garden (Dan Pearson): Dan Pearson’s tribute to the immortality of the grand gardens of Chatsworth is a sight to see this year. Between the planting and the huge rockery made from stones picked for their lichens and mosses, the garden looks like it has been there forever. But my favourite piece is actually an idea lifted form the real Chatsworth – the trout stream. This wonderfully tranquil water feature runs through the planting and rocks and like everything else in this garden you could swear it had been there for centuries. While the rockery certainly gives the garden drama, the stream I think brings the whole thing together with a tranquil centre that’s good for the mind and soul. Home: Personal Universe (Fuminari Todaka): This one has got to be my favourite, and yes it is a Japanese garden and yes regular readers will know I’ve got a weakness for Japanese gardens, but I have picked this water feature not just for its aesthetic value but its practical brilliance as well. Designed like an aquatic chandelier, this water feature drops a circular curtain of water into a pond, the flow so perfect that it genuinely looks like sculpture at times. But that’s not all it does, the splash and gurgle of the water gives a lovely ambient noise to the garden, not intrusive but just right as a soothing background in keeping with design of the garden. What’s really clever about it though is that that ambient splashing actually cancels out background noise. 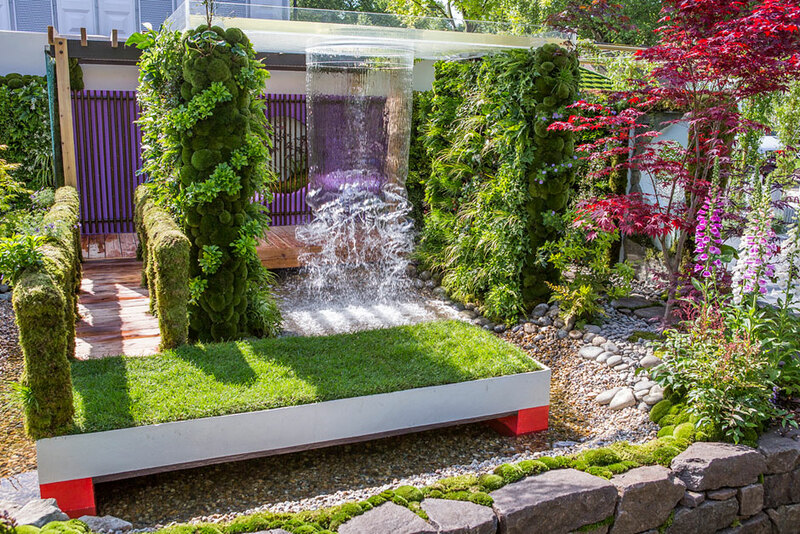 Designed for urban gardens, this water feature creates a soothing cascade of white noise that occupies the attention usually given to the noise of traffic or people talking in the distance and since the water is closer it tricks the brain into blocking out those other distractions, letting you focus on the beauty of the acers, the sublime mosses, wonderful bonsai tree and just generally float your way to inner peace. The M&G Garden (Jo Thompson): I was so disappointed that this wonderful garden didn’t make gold. It is simply stunning. A water feature that is so deep you can swim in, we haven’t seen anything so dramatic since the Australian garden back in 2013. The garden was inspired by Sissinghurst and its soft inviting planting is wonderful. The water feature itself is so harmonious with the rest of the hard landscaping. An excellent design. These are just a few of the brilliant features from this year’s Chelsea, there are plenty more to come that we haven’t had a look at yet so keep checking back for more.